The answer is that all the stars and constellations shift westward as the seasons pass . . . and they also move westward in the course of a single night. Orion is no exception. Exactly when Orion will disappear from the evening sky – into the sunset – depends on your latitude. The farther south you are, the longer you can see Orion. For the central United States, Orion is lost in the sun’s glare by early to mid-May (depending on how carefully you look for it). For all of us in the U.S., Orion is gone by the time of the summer solstice in June. 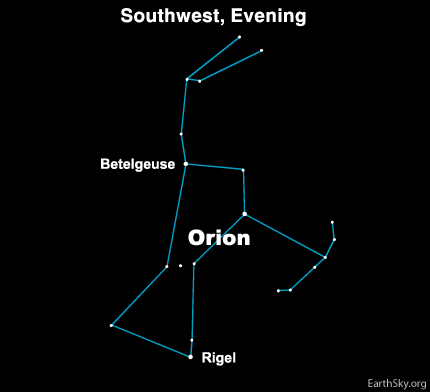 Either way, you can definitely notice Orion moving steadily westward. The westward shift of the sky throughout the night is due to Earth’s spin under the stars. However, the westward shift of the stars throughout the seasons is due to Earth’s motion in its orbit around the sun. Earth’s motion in orbit causes our night sky to point out an ever-shifting panorama of the galaxy. Why does Orion go into the sun’s glare each year at this same time? Because each year, as we orbit continually around the sun, our motion in orbit brings the sun between us and Orion at this same time each year.